Kindergarten and EGL is home for Laura Patterson. She believes God has called her to serve Him here among His people. She has been in education long enough to realize and know that if anything good happens in her room, it is by God's grace and HIS grace alone, not on her merit. The teaching ministry is filled in blessings -- not a day goes by that the Lord doesn't reveal Himself in ways both large and small. In 1992 Laura married Brad Patterson, and God has blessed them with 3 children who continue to surprise and bless them -- Meghan, Danny, and Jenna. The Patterson's value the strong Christian education with which their children have been blessed and are grateful for the good work God continues to do in them. Laura was born and raised in Menomonee Falls, WI. She attended Zion Lutheran, Milwaukee Lutheran High School and Concordia University-River Forest. She was raised in a family with 4 brothers and 4 sisters. Having been raised in such a godly, loving home and now having the gift and blessing of her own family, Laura believes family is one of God's sweetest earthly blessings. Following her graduation from Concordia University - River Forest (now known as Concordia University - Chicago) in 1983 with a BA in education, she first taught Second Grade in Chicago, IL, for 5 years before returning home to Wisconsin. She spent two years teaching at the Kindergarten level. 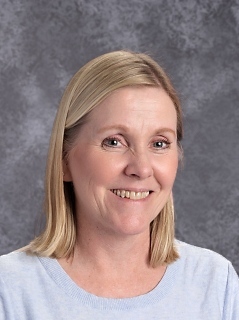 In 1990, she accepted the call to teach First Grade at Our Redeemer - Wauwatosa where she taught for 24 years before the Holy Spirit called her to the teaching ministry here at Elm Grove Lutheran. Laura’s Mission Statement: God has called me to feed HIS lambs. It is by HIS grace alone that the children in my classroom grow and learn. Through our daily interactions, I pray my students and their families learn or are reminded that they are precious to our Creator. Literacy instruction is woven throughout the day. Children are actively involved in the learning that takes place. As we live, laugh, and learn in our room, God does amazing things. All messes are mine. All successes belong to HIM. To God be the glory! 4th quarter church and Sunday school attendance sheets come home today, as I wasn’t sure if I sent the new forms home! Sorry! Your child made a set of Resurrection Eggs. They are special eggs that tell the greatest Good News story ever! Your child brought the eggs and a storybook home to tell the story. Please give your child the opportunity to share this with you and anyone else. God bless! Please return your child’s library book on Monday. We will resume attending chapel upstairs with the 1st through 8th graders after Easter. We continue to worship with our Early Childhood friends on Thursday. Please consider an offering of thanks to our Eternal Savior for His mighty work in redeeming us and making us His own. May 9th is our Spring Fling. Please plan for your child to be here. May 13th is Track and Field day. May 17th is our Golf Outing/Auction. The kids are dismissed from school at 11:00 a.m. I hope to see you at Ironwood! May 20th we will spend the morning at Kids in Motion, travel to Elm Grove Park for lunch (weather permitting) and stay to play! Siblings are more than welcome to join us. May 22nd we gather to celebrate our kindergarten graduates!! !